We took 6ixspots abroad for this interview. We were lucky enough to find ourselves in Singapore and wanted to chronicle some immigrant hustle in another part of the world as well. 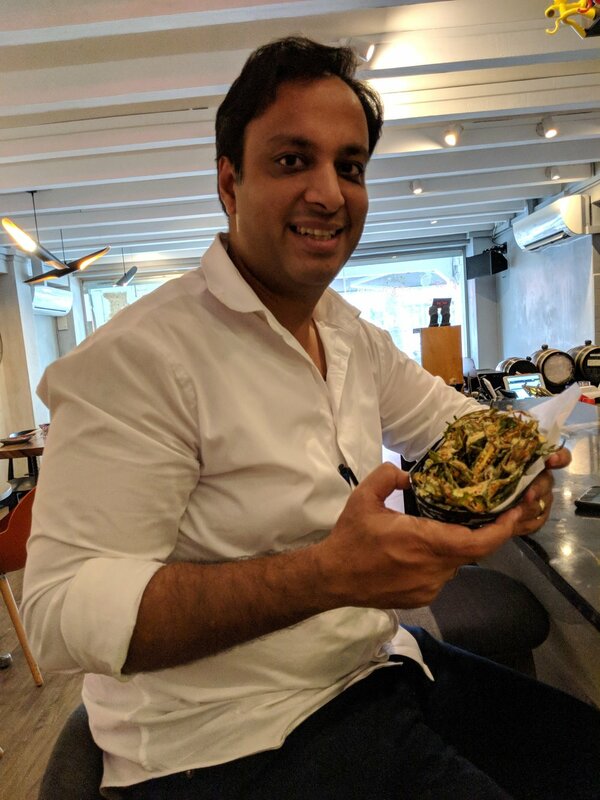 Both of Sumeet's restaurants are well-reviewed and revered, and they boast some of the best food that Singapore has to offer. We were happy to celebrate his restaurants and show him some love from Toronto, and he was kind enough to indulge our questions. Andrew: So how did you come up with a name like ‘Flying Monkey’? Tell me about the name of the restaurant. Sumeet Singla: In Hindu mythology we have this monkey guard. He flies around, so it’s based on that. I’m not a religious person per se, but it’s something inspiring and yeah it’s derived from there. S: It’s just translation into Pizza Factory. That was the other thing I wanted, was a modern, contemporary pizzeria. Not the traditional – we don’t put the heavy Italian music or the checkered tablecloth – we wanted it very sleek, very modern, so we went with a contemporary, industrial thing. A: And why’d you go with that? It is something that is very noticeable; it’s not your typical pizzeria. S: Yeah we wanted to stay away from that. We wanted to do something different, something unique, and people don’t associate our place with a heavily themed Italian place, with the big pictures of like the Amalfi Coast, or the Coliseum. So yeah we stay away from that. A: Yeah because Flying Monkey also has this sleek, modern aesthetic. S: Well when I go to eat Indian food, or even Korean food or Japanese food, I don’t like to go to places where they put, like, loud K-Pop and like heavily themed restaurants. It just puts me off of it. And most of the restaurants around here are very heavily themed, like Arabic restaurants, Turkish, and that kind of puts me off of it. A: I mean, you live in Singapore, is there any particular reason why in this particular neighbourhood you opened up these restaurants? S: I definitely—I didn’t want a restaurant in the shopping centre. It’s something I don’t like to go personally, to restaurants in the shopping centre. So I wanted them in those traditional shop houses, those old school shop houses, and this area has a lot of culture, it has a great vibe and it’s very colourful. A: So tell me about the Bollywood café upstairs and the improv show. S: We did a pop-up for a Bollywood festival. They took over the space for some days and they had all these kind of Bollywood-themed bands. My friend’s friend, he said they do improv on the side, just part-time, so I said “Why not? You can use the space.” So we don’t charge them for the space. People just come and buy their drinks or food so yeah. It’s kind of like supporting independent guys, independent artists. A: If you’re not eating at a restaurant then what’s your favourite thing to eat? If it were your last day on Earth and you could only eat one thing, what would it be? S: It would be a pizza for sure. A: A pizza? What would be on the pizza? S: Just a Margherita. Like a nice buffalo cheese, San Marzano tomatoes and that’s it. A: Very, very nice. And we talked about this last time, but do you read reviews of your restaurant? S: Yes I do, it’s definitely very important. Moreso, like customer reviews besides the media coverage I think. Media coverage is one thing but for me it’s like, Trip Advisor, Google, what people write about us and how we can improve, how we can use that. Like, earlier it used to bother me a lot when we got a bad review. I used to get worked up, but now I’m more relaxed about it and more chill. That doesn’t mean that it’s not important. It’s still equally important; I just don’t get so hyperactive any more. It’s mostly, if you get a bad review, 80% of the time there’s some message in there, an important message which we can take and improve on that. You always get those 20% customers that did not like your style or they were upset about something and they just give you a bad review for no reason, but 80% of the time when people write something wrong or something bad it’s definitely something we did not execute correctly, so we can always use that and improve on that. A: I learned something about the Singaporean reviews versus North America. They write really, really long reviews. S: Yeah, sometimes it is very personal. Like they don’t like a particular waiter or something, they just write a bad review. A: And what happens if they review things and you think it was unfair? Like for example, I remember you telling me a time someone reviewed your pizza and they said it was “too soggy” and the crust was “too bready.” It wasn’t what they were expecting, but you gave them a Neapolitan pizza, they just didn’t—so how to you react to it in those situations? S: We would explain to them, and I did, I responded saying “that’s how a Neapolitan pizza is supposed to be and if you don’t like that style...” The lady wrote that Domino’s is her favourite pizza so, you know, I told her that that’s not our style of pizza and we are very far from that style of pizza. We like to respond but not always. I don’t feel it’s necessary to respond. But sometimes it’s really unfair. Recently for this place, this review that a guy wrote, that we charged him incorrectly, we tried to cheat/scam them and we were dodgy with the billing, and we were not. I even sent a copy of the receipt to Trip Advisor but they refused to take it down, they said it still falls under their policy of fair reviews. It’s a bit unfair that the customer can put a photograph of what they want, but in response the restaurant cannot put a photograph, so I feel that’s a bit unfair, but it’s like that. A: Fair enough. And what was that famous Singaporean food reviewer you were talking about? The guy in the newspaper? A: Yeah like, table size. S: But all in all I think it was a very good review because he used some very strong words for explaining our food and he really enjoyed our food. A: That’s important. So tell me when you started your business, but has business always been great? S: Not at all. I mean, this is my second restaurant so I’ve learned now that it goes in a cycle. Always when you open a restaurant and get some media coverage, then the bloggers come in, then the business picks up, but then you have this plateau and then you just have to keep working. You have to improve on your food, your service, the experience, and it starts to go up again. We had our downfall and it’s starting to pick up again. A: To you, what’s the best part of this job? Why do you work so hard every day to run a restaurant? What do you look forward to? S: So for me, I love to host people. Even when I was in college, all my friends used to eat in my room all the time. Even drinking wine, or drinking beer, eating good food. It’s just my passion. I love to host people. I love to do service; I always do tableside service. I love to engage with my customers. And when I see my customers enjoying our food and drinks it just makes me very, very happy. It’s just that. A: Do you have any stories of any favourite customers you’ve had over the years? **S: We had this one guy come to Fabbrica like continuously for many days, I think maybe like two weeks straight every night. It’s not like he tried too many different things on the menu—he was just eating like, really rustic Italian things. Like simple pasta or pizza, that’s it. He just kept coming every day alone by himself. I’m like, “who is this guy?” He comes every night by himself. Maybe he just lives around the corner or something. So the next day when he came—and he didn’t speak much English, he was a quiet guy, he didn’t speak much English, liked to sit by himself—I went up to him and I started talking to him and he told me he’s in Singapore for one month, he’s on a project for one month. He’d tried a few Italian restaurants near to his hotel and he didn’t quite like them. They were too pretentious and he just liked simple, home cooked, Italian food and someone recommended this place and he just loved it so much. He was there for 30 days and he ate like, 25 days at Fabbrica. That was really good. A: That must have felt great. S: Yeah it was really great. A: We’re nearing the end so thank you so much for being generous with your time. But, as you worked and trained in the restaurant business you probably had a lot of people wanting to help you—did anyone tell you any one piece of advice that has stuck with you to this day? **S: The most important thing someone told me—a lot of people told me “there’s a massive manpower crunch in this industry, don’t do it.” but I still wanted to follow my passion for it and I thought “how bad can it be?” So I still did it. A: Oh wow that’s really good. And now given your extensive experience now, opening all these restaurants, if someone was looking to open a restaurant today, what would be the piece of advice you’d tell them? A: I think that’s all we have, thank you for your time!